A decision by the 11th Circuit Court of Appeals in Atlanta could determine whether Mobile taxpayers spend roughly $1.2 million per year more disposing of yard debris. While the city’s Solid Waste Authority appeals a $5 million judgment against it for the breach of its contract with Waste Management, Executive Director of Finance Paul Wesch told councilors at a June 28 meeting the city would continue to send its yard debris to Dirt, Inc.’s landfill instead of to WM-maintained Chastang Landfill. Wesch said sending the debris to Chastang, which was stipulated in the award, would cost the city $1.8 million per year because it is designed for regular household garbage. In comparison, dumping the yard trash at Dirt, Inc. cost the city about $600,000, he said. At the meeting councilors approved moving forward with this year’s payment to Dirt, Inc. In early 2015, a jury in U.S. District Court determined the city’s Solid Waste Authority owed Waste Management Mobile Bay Environmental Center roughly $5 million for breach of contract related to the perceived failure of the authority to raise the rate it allowed Waste Management to charge the city as a tipping fee. The jury set a higher tipping fee and, as a result of the judgment, the city would have to start dumping yard waste at the landfill managed by Waste Management. According to court documents, attorneys for the authority have asked for the court to hear oral arguments based on several factors. In a brief filed with the court in March, the attorneys argue the U.S. District Court didn’t have proper jurisdiction in the case because while they claim — and the defendant admitted before the previous trial — Waste Management Mobile Bay Environmental, the plaintiff, is headquartered in Madison, Mississippi, there was no evidence supporting that they do business in another state besides Alabama. The authority’s attorneys also argue half of the $5 million award was given because the authority didn’t negotiate in good faith. Since state law doesn’t recognize a “contract action for breach of a duty of good faith,” they argue it should be reversed as a matter of law. “Moreover, the evidence was not sufficient to support a finding either that the damages were owed under the contract or that the appellant actually acted in bad faith,” court documents state. 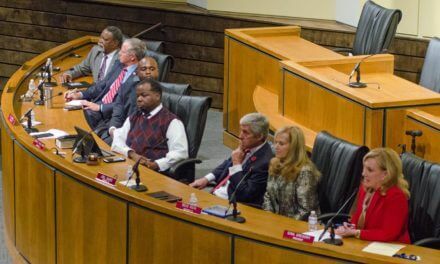 In addition, attorneys for the authority argue the burden placed upon Waste Management to prove it needed a tipping-fee rate adjustment had not been met and any increase in fees had to have been mutually agreeable. “The contract does not make it sufficiently clear that the authority was under a mandatory duty to pay WM Mobile for the costs claimed or to pay the increased waste disposal fee demanded,” the brief states. The contract requires “documenting” of the “cause for the adjustment” to the “reasonable satisfaction” of the authority. The authority is also challenging discovery procedure related to testimony and a spreadsheet presented by Waste Management employee Michael Bass supporting the company’s assertion that it lost profits due to the breach of contract. A brief filed by attorneys for Waste Management argues the issues raised by the Solid Waste Authority are “without merit” and oral argument is not needed to uphold the district court’s decision. Waste Management further argues the authorizing legislation for the authority makes it an independent public corporation and not the type of agency courts hold as part of the state for jurisdictional purposes. Its attorneys also argue there is plenty of evidence supporting the jury’s finding in their favor. Waste Management’s attorneys maintain the authority did breach its contract with the company, adding that evidence at trial supports that notion. Waste Management attorneys also argued Bass’ testimony met all the necessary evidence requirements and was properly admitted at the trial.